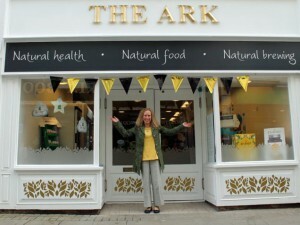 The Ark is the local independent health hub in the centre of Haverfordwest. The health food shop offers a wide variety of healthy foods, special diet ingredients, supplements, free from household items and beauty products that are good for you and the environment. You will also find a selection of home brewing equipment. They are proud of their centre of excellence with many practitioners of health and wellbeing, offering 1-to-1 sessions and smaller classes. Lise Matthews runs the business and was a highly qualified health practitioner for many years before taking over as the owner of the health food shop and clinic in 2011. Since then the business has gone from strength to strength with many more people interested in a long and healthy, pain-free life. Customers and patients are met with a friendly smile from the wonderful staff and practitioners, who are all qualified to provide the best health care and food choices. A healthy diet is often the foundation for good health, and The Ark sources their products very carefully. There are no E-numbers, additives or colouring used here. They are passionate about getting people better and this often includes a good chat to find out how they can best help. This is all part of the service at The Ark so pop in for a chat! People increasingly pick up important health messages from the media and The Ark has seen a huge increase in demand for products that are mentioned, for example they stock prebiotics, Inulin, Kefir, Sauerkraut and Turmeric, all with impressive health claims. The health food shop and the health care clinic provide all you need for healthy, happy living. They offer drug-free treatments and free-from foods, drinks, household items and skin care that are good for you and the environment. You will also find a selection of home brewing equipment. Their Ecover Refill area is a great way of saving plastics and a cheaper option. Customers happily bring in their empty containers and refill them. In the new premises, this area will be expanded with barrels with loose foods and scoops to fill your own bags. This is an exciting phase and to see such a vast assortment in Haverfordwest. People travel far to visit The Ark. We are so excited to have created an environment where health care is the focus and completely personalised to you. We provide specialists to treat a range of chronic and acute health conditions. Allergy testing, Acupuncture, McTimoney chiropractic, Chiropody, Sports massage, Fascial and oncology massage, Hypnotherapy, Counseling, Herbal medicine, Homeopathy, Reflexology, Reiki, Colonic hydrotherapy. Practitioners working from The Ark are fully qualified and have many years of experience. Patients often say how much better they feel even within the time of the treatment. We take the time to explain symptoms and treatment plan. New in Bridge Street is the lovely sunny room for small group classes in yoga, pilates and mindfulness. They have been lucky to team up with experienced teachers who cater for all levels, and you can join the classes with the confidence that you are being looked after. There are regular talks and introductions to health topics so keep an eye on our programmes. Find us at 5A Bridge Street, Haverfordwest, SA61 2AL.